Today, Whole House Water Filter Systems announced the availability of their comprehensive website that provides extensive information about how a whole house water filter works. The site contains helpful articles, videos, product listings, comparisons and even customer testimonials, to help homeowners make an informed decisions when purchasing a water filtration system for their home. “We are providing the information as a helpful guide for consumers who are interested in learning more about water filtration systems in their home, how they work, and the benefits of having a house water filter.”, said Steven Wiebe, President of Whole House Water Filter Systems. According to a recent study conducted by the EPA, it was concluded that most consumer homes have an elevated level of chloroform gas present within the home, this is due to the vaporization of chlorine and other chemicals from common sources such as tap/drinking water and water used in everyday bathing or showering. With proper research, information and the right type of filter, consumers can have clean water in their plumbing system, removing the worry of sediment build up on your plumbing fixtures or even the walls around your tub, and will help to improve the home's indoor air quality - Which is how a house water filter works. 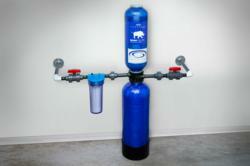 “How a house water filter works will benefit every aspect of your family’s health. Pure water is one of the most important things to any living creature. We all know that without water, there can be no life.”, concluded Wiebe. The house water filtration process can divided into three distinct stages of how a house filter works: Stage 1 is a pre-filter that removes dirt, rust, and microscopic particles that can cause water to look cloudy and causes scaling on plumbing fixtures, sinks, and tubs. Stage 2 is a blend of KDF, which is a copper-zinc oxidation, and crushed mineral filter stone to remove the chlorine and heavy metals. Followed by Stage 3 which uses high grade activated carbon (The most important part of how a house water filter works). Granular activated carbon is the final reduction of chlorine, as well as other chemicals that are common in house tap, drinking and bathing water.